I'm a bit late this time with the news, my little Greek holiday hideaway experienced an electric blackout, preventing me from checking my emails and writing about the new Indochino Collection and the updated Indochino Website. The functionality/structure of the website remained pretty much the same, but features updated photos of most products, new background images, new fonts and some other changes that I will go more into depth incl. screenshots. My first impression was that everything seems much more fashion forward now, with female models and probably a different photographer. 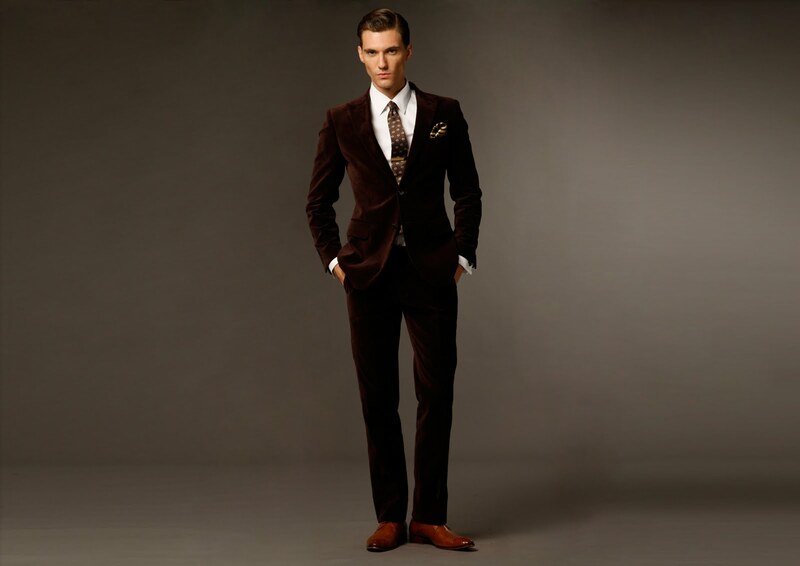 As mentioned earlier, the big new collection is called "The Hedonist Gentleman Collection". The Hedonist Gentleman Collection features luxurious velvet and elegant pinstripes, inspired by the hard-working, pleasure seeking 1950's and 60's man. The “Hedonist” updates those classic styles with slimmer silhouettes and colorful customization for added personality and fun. The biggest surprise of the new collection are probably the 3 velvet (made from cotton) suits (and one blazer), available in 2 browns, velvet and navy. Overall, the suits have broader lapels (compared to the slim lapels of the previous collections) and I'm sure many of you will be happy to see that many suits now have detailed fabric descriptions (thread count, weight, etc.). Furthermore, the model's suits are now also a bit longer again, more suitable for work environments. Apart from the velvet suits, the new collection also brings a new Navy fabric and a couple of pinstripe fabrics, like the Mason Grey Suit pictured below. Some of the fabrics are a bit on the heavier side, suitable for winter. But not only are there new products, Indochino also used the opportunity to remove some older products, including the just recently introduced (and controversial) Unibomber Jacket. The low number (3) of outerwear products currently available suggests some more to come with the colder season. Apart from the new suits, a couple of shirts have been added. Dark fabrics, which I personally dislike, but I assume many people like. Usually, coupons quickly lose their validity once a new collection gets online, but I did a quick check on some and they mostly still seem to work.